I think I'm usually terrible at making masculine cards, but I've got one to show today that makes me proud! I inked the edges with Antique Linen and Early Espresso to age it. The panel behind the cereal box is embossed with a herringbone pattern (new to me), its edges also inked. A sentiment seemed necessary on this card, so I printed my own. I went to THIS website to get my quote, then created it in Microsoft Word. Isn't it just perfect for this number stamp?? I printed it out in different size fonts and landed one that fit into a Grommet Tags die. 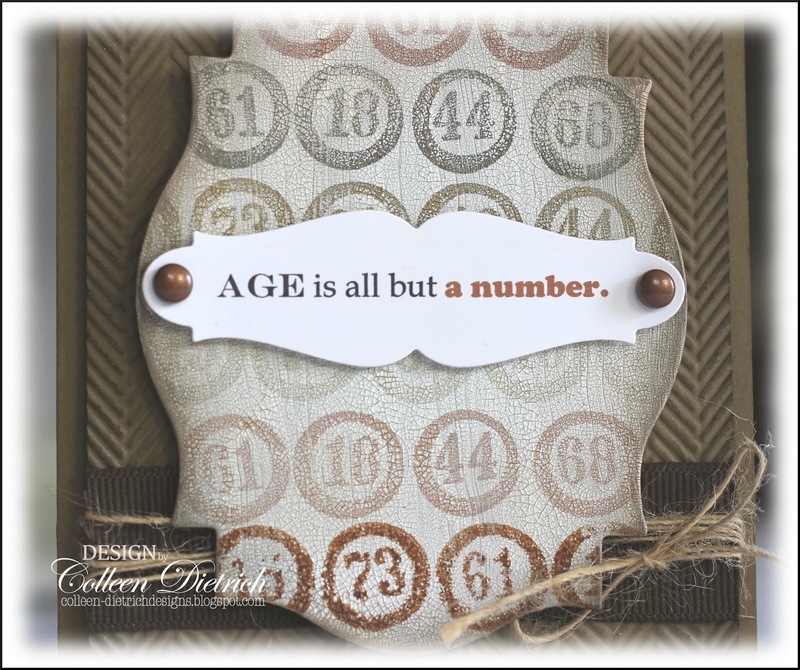 Flourishes Timeless Tuesday - "birthday"
Thank you sooo much for joining me today! This is just WONDERFUL! Better yet, in perusing the Lost Coast Design stuff, I found out that they were the maker of a couple of stamps I got last year at a stamp show...THANK YOU!!!!! What an awesome company! Very cool - you find the coolest things and do the coolest things with them. This is one great MAN card!!! Hugz! How clever, Colleen!! Love your card!! Oh my, Colleen... it's fantastic!!!! Absolutely love this! You rocked this masculine card! As you know, I dread them! I think I start breaking out into a sweat when I need one...ha! This is a great one! Is this fun or what? Great idea! I never know what to do with those bingo numbers. This is perfect! Fabulous masculine card! Love all the bingo numbers! Great job, Colleen! Happy Easter to you and family, hugs! I have to agree with you -- this is one fabulous masculine card! That crackle paint makes that cereal box look like a million bucks! Great idea and a super card for those masculines that are so hard to do. Thanks for reminding me I have that embossing folder. I think I used it two years ago at Christmas and must have hidden it from myself. Duh!! What a great use for the cereal box Colleen! Looks great. Love the bingo numbers. Great masculine colors. Brilliant idea for using border stamps! Love it Colleen! Have a fabulous Easter weekend! WOW I really LOVE this masculine card!!! The texture and warm colors are fantastic! One of my favorite accents is twine, so I adore how you wrapped the twine around. Fabulous card! 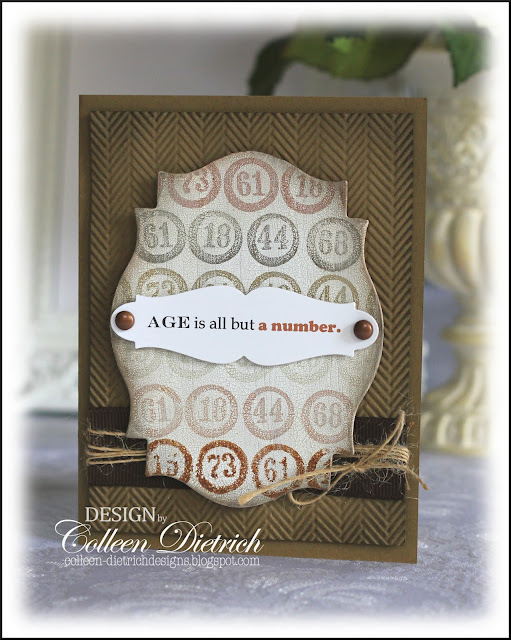 Love the stamped crackle and the great embossed background. TFS! 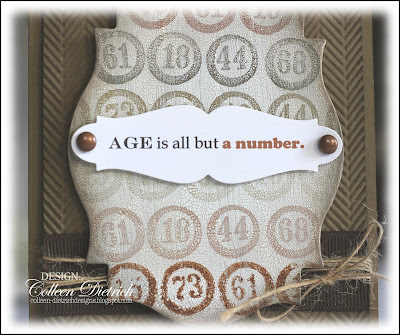 LOVE that Bingo chip border, and it pairs so well with your sentiment! Gorgeous, guy card, girl! How creative~ Fabulous neutral tones and the border looks awesome against the background. Love the twine accent, too! Awesome card. Congrats on your Moxie Fab win, Colleen. What a great idea for a birthday card, Colleen! Thanks for the link to the quote site. I'm always looking for something add to my cards. CONGRATULATIONS, Colleen!! What a fabulous accomplishment for this to be named a winner over at Moxie Fab World. You really deserved it!!! I love this cool masculine design. Very hip!! !